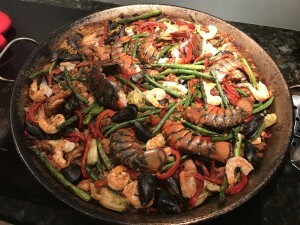 Last night we were at a friend’s house and they served a wonderful Paella. This contained lots of paprika, vegetables, and protein. All spicy peppers like paprika are high in vitamin C. A Hungarian Scientist, Albert Szent-Gyorgyi, was curious why his countrymen used paprika for every sort of ailment with good results. He identified the molecular structure of vitamin C in paprika. The artichokes, asparagus, and red bell peppers are high in B vitamins and minerals. The proteins and fats can be utilized by the body properly with the balanced food intake. This keeps us healthy and prevents degenerative illnesses. You really can know if you are safe. There are two tests that have both a cardiovascular and nutritional component and then a third test that is specific to cholesterol. The food that we eat is broken down into cell usable components to make energy. The tests we are going over today are specific to the cardiovascular system but they also tell us if we are meeting our nutritional demands. Proteins and fats need a lot of antioxidants, B vitamins, and magnesium to be processed. If these nutrients are not adequate then the breakdown and use of these foods is not done properly and we have tissue damage. Fats are sent to the liver for metabolism. Approximately 70% of our fat intake is used by the liver to make cholesterol. Cholesterol is needed to make hormones. The more stress we are under the higher the cholesterol. Cholesterol really does not elevate with fat intake, it elevates based on body demands brought on by stress. The cholesterol needs antioxidants to be stable. Think of a stick of butter. Butter is quite stable for a long period of time before it goes rancid. What keeps it in an edible form is antioxidants in the dairy fat cells. The cells can use the antioxidants along with the fat in the cell to maintain the cell wall keeping it fresh. As the antioxidants are used up the cell wall fragments and we call it rancid. The fat has oxidized. The same goes for cholesterol in your blood stream. If we have an adequate intake of vitamin C, E, and the mineral selenium the cholesterol is very stable. Artery cells will take this rich food source in and use it to maintain energy production. Everything is good as long as the cholesterol has enough antioxidants to prevent it from going rancid. The test to run is Oxidized LDL. This lets you know if your cholesterol is healthy for your body. Homocysteine is another test that measures the breakdown of protein. As protein is digested and absorbed it is converted into amino acids. As the cells use the amino acids the end by products are secreted through the urine. The breakdown of the amino acid to urine requires several steps and the process will stall if you are low in B12, Folates, B 6, and magnesium. If the break down system is stalling we will see this with the elevation of Homocysteine. Homocysteine is an artery irritant and it shows nutritionally that we are experiencing degeneration throughout the body with nutritional deficiencies. The Cardiac C Reactive Protein test actually measures inflammation in the artery. If it begins to elevate we know that there is something nutritionally missing in the cells of our body and it is causing artery damage. The Cardiac C Reactive Protein, Homocysteine, and Oxidized LDL tests will tell you if you are nutritionally balanced or not. If there is any family history of arterial disease these tests are a real value. A lot of what we would think of as genetic, “It runs in the family” is really a defect in the absorption, conversion, and metabolism of certain B vitamins or a very high demand for magnesium or vitamin C.
We have to remember our urban environment is quite stressful and the adrenal glands manage our stress loads. The stressed adrenals use very large amounts of vitamin C, B 6, and magnesium. The same nutrients that protect our cardiovascular system. Thanks for reading, use some paprika today.